The proprietor of the Cosmopolitan Pharmacy was Sigmund Muldberg. A physician who graduated from Belgium’s University of Ghent in 1889, he immigrated to the United States shortly thereafter. Sigmund Muldberg (Cosmopolitan Pharmacy), 79 Willett Street. These are the only two listings I can find that provide a direct connection between Muldberg and the Cosmopolitan Pharmacy. 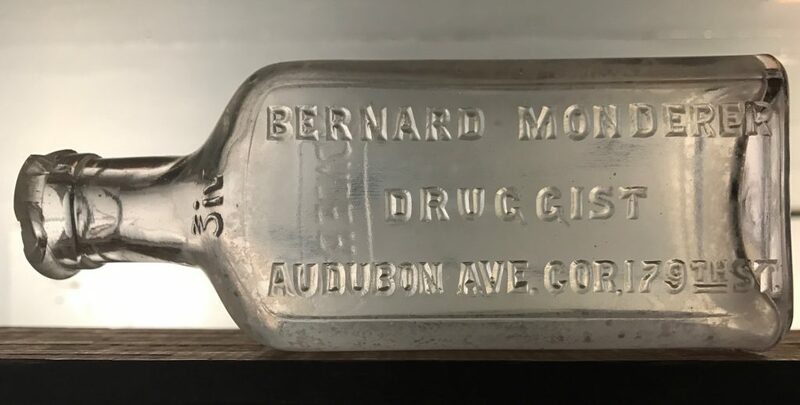 However between 1896 and approximately 1908 Sigmund Muldberg was listed individually in the NYC general directories as a druggist and physician. Generally (but not always) the physician listings included an address of 234 Rivington Street and the druggist address was 79 Willett Street. 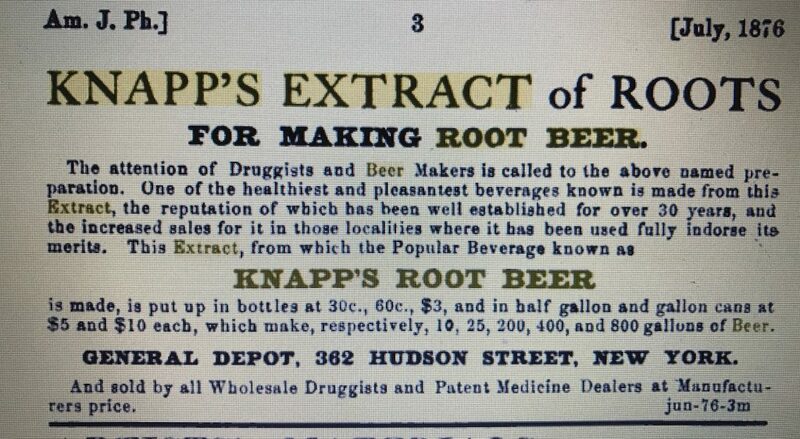 According to the 1905 ERA Directory the pharmacy provided services in “drugs and medicines” and “drug sundries.” It did not include other services typical of pharmacies of the time including tobacco products, liquor products or a soda fountain. 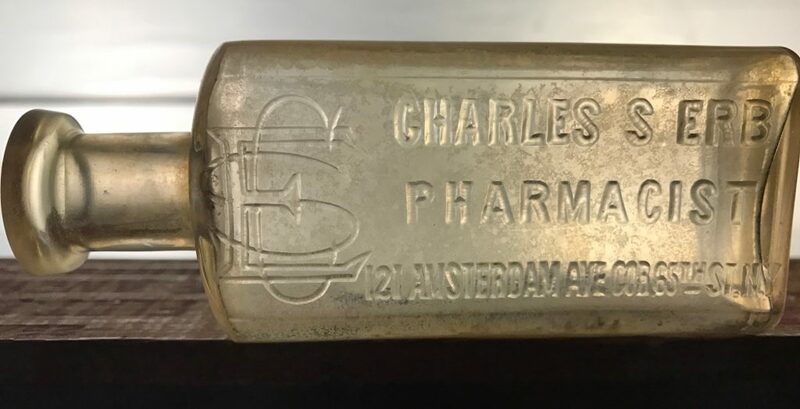 This all leads me to conclude that Muldberg probably ran both a doctor’s office and associated pharmacy/drug store out of the same building on the corner of Willett Street and Rivington Street (the location embossed on the bottle). If I’m right, the “Cosmopolitan Pharmacy” name may date back as early as 1896. Around 1909 Muldberg relocated to 323-325 Second Avenue where he remained listed until at least 1922. In 1925 he was listed at 411 West End Avenue. After 1911 he singularly listed his occupation as “physician”, and no longer included “druggist.” in any listing that I could find. Muldberg was not listed in the 1933 NYC directory and 1940 census records listed his wife, Annie, as a widow. This indicates that he passed away sometime between 1930 and 1940, probably prior to 1933. There was a Cosmopolitan Pharmacy listed in the NYC directories between 1909 and 1915 with an address of 612 Tenth Avenue . The name of the proprietor was Reuben Hird. It’s possible that Muldberg sold his pharmacy business to Hird in 1909 but I can’t make a definite connection. Rivington Street and Willett Street both no longer exist at this intersection. They area is now part of the Samuel Gompers apartment building complex. The bottle I found is a small (approx. 4 ounce) mouth blown medicine with a tooled finish. It was made by the Whitehall Tatum Company and it has that company name embossed on the base. The embossing includes an ampersand (between Tatum and Co) indicating it was made prior to 1901 when the business incorporated. 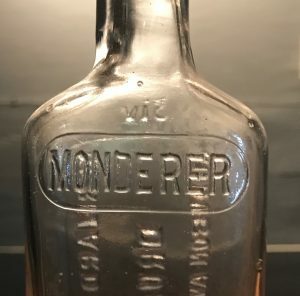 This is further evidence that the “Cosmopolitan Pharmacy” name may date back to 1896 and dates the bottle to the period between 1896 and 1901. Brock L Carroll, Far Rockaway L.I. Brock stands for Brockholst Carroll, apparently a prominent Far Rockaway name at the turn of the century. He served as the last Village President of Far Rockaway (before they became part of NYC). His mineral water business existed from at least the mid 1870’s until his death in 1905. 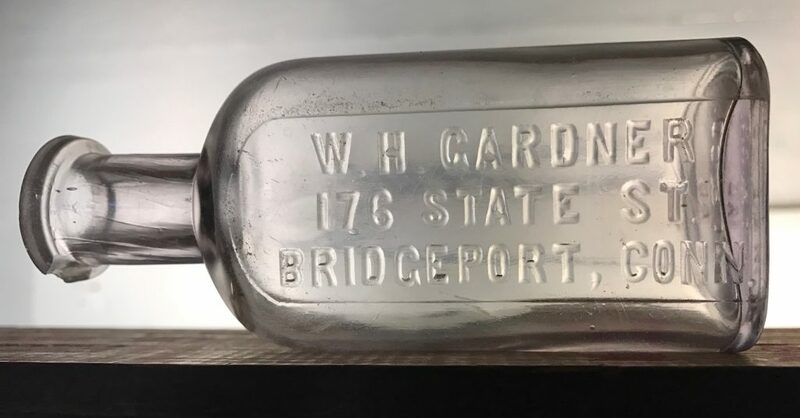 The first listing I can find for Brockholst L. Carroll was in the Rockaway section of the Lain’s Directory of Long Island in 1878 -1879, classified as mineral water. He was also listed as the excise commissioner in the same directory. The business was listed under Soda and Mineral Water in the Far Rockaway section of the 1890 Lain’s Business Directory of Brooklyn, located at the foot of Broadway. According to “Far Rockaway Reminiscence” a presentation given by Valentine Smith in 1934, the original bottling plant on Grandview Avenue burned to the ground on Columbus Day 1892. Later, the business continued to be listed as a manufacturer of mineral water. In the 1899 Trow Business Directory of the Borough of Queens two locations were given: Broadway in Far Rockaway and Central Avenue in Lawrence. It was also listed in the 1903 Trow Business Directory of the Borough of Queens with just the Broadway location (foot of Broadway). Grandview Avenue is currently named Beach 17th Street and Broadway is named Beach 19th Street. Based on the address given as the foot of Broadway, I suspect that the business (both original and rebuilt) was located near the ocean beach between what is now Beach 17th and Beach 19th Streets. The second location in Lawrence may have been needed during the rebuilding process. The area between Beach 17th and 19th Streets now serves as parking for beachfront residential high rises. Strangely, I found the story of Carroll’s death in the February 1, 1905 edition of the Scranton (Pa.) Republican. Brockholst Carroll Passed Away. A Hymn on His Lips. New York, Jan 31. – Brockholst L. Carroll who was the last president of the village of Far Rockaway, died in his home in Review Avenue, Far Rockaway, Sunday evening. Mr. Carroll was fifty-eight years old. Calling his wife and five children to his bedside on Sunday afternoon he told them he believed his end was near and began to sing hymns. At night he grew weaker, and then he started to sing “Think of Me.” After a few words he gasped for breath and passed away. 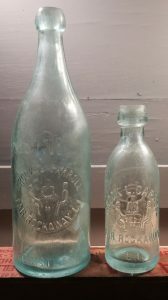 His bottles are one of the most plentiful finds on the bay, probably because they are extremely heavy and durable. I’ve found a total of 18 (16-8oz pony’s and 2-28 oz sizes) and all are tooled blob tops. I’ve never observed a crown top finish or machine made version. This agrees with a 1905 or earlier end date. 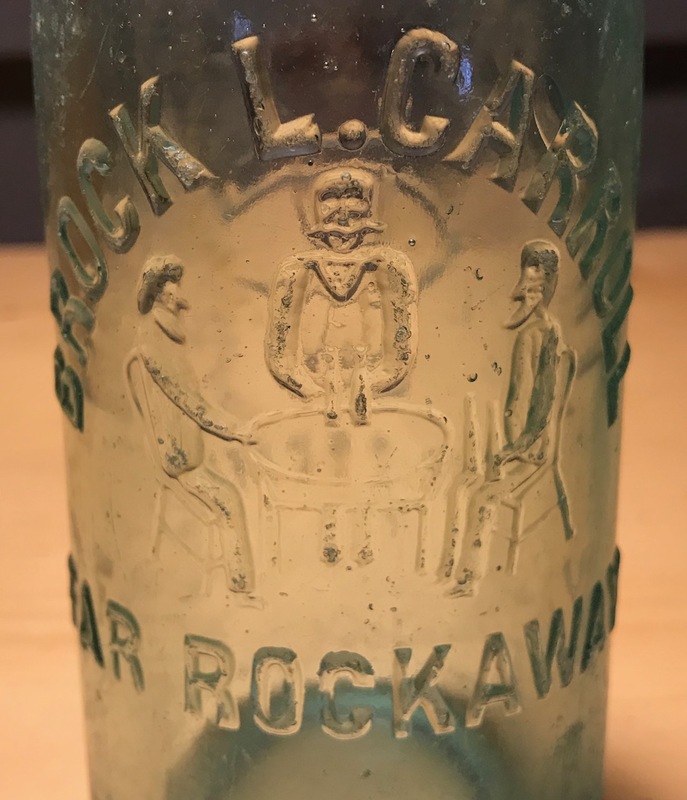 The embossing on all of them refers to “Far Rockaway Long Island.” This would indicate they were manufactured in 1898 (the year Far Rockaway became part of NYC) or earlier. I’ve never found one with “Far Rockaway N.Y.”embossing so it’s possible he just never went through the cost of changing his molds. The embossing includes a picture of two gentlemen seated at a table that are being served bottles of presumably Brock Carroll Mineral Water by a waiter with a large mustache. 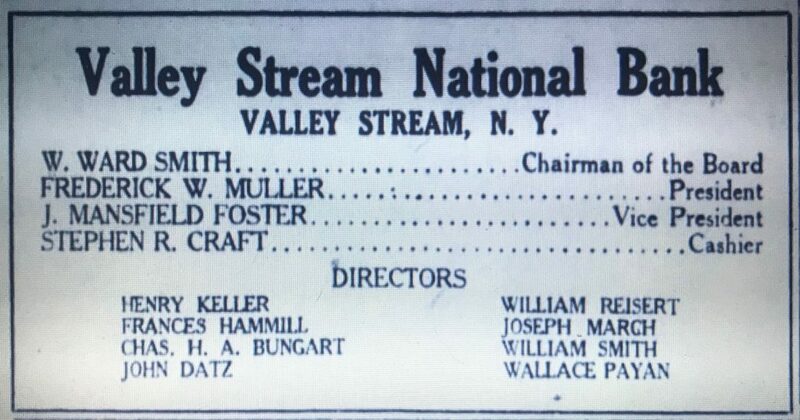 The first mention of Henry Brenwasser in the NYC Directories that I can find is 1909. He’s listed as a druggist with the 226 Ninth Avenue address. Around this time he went into business with Frank N Pond. The business of Pond & Brenwasser (Frank N Pond & Henry Brenwasser) is listed in the Trow NYC Copartnership and Corporation Directories from 1908 to 1914 at 226 Ninth Avenue. The business is not listed in the 1906 Copartnership and Corporation Directory and the 1914 Directory states that Pond and Brenwasser was dissolved. Later Brenwasser appears to have gotten out of the retail drug business. According to the February 3, 1913 issue of Industrial World and an issue of the Paint, Oil and Drug Review from around the same time, Brenwasser was an incorporator in a new corporation called Glycola Co, Inc. The company was listed as “chemists, dry salters, oil and color men. Capital $75,000. Incorporators: Jeheil H Patrick, 333 Ninth Avenue, Furman K Ruff MD, 343 W 23rd St and Henry Brenwasser, 226 Ninth Avenue. The 1915 – 1916 Directory of Directors in the City of New York list Brenwasser as the Secretary and Director of the Company and it’s still located at 226 Ninth Avenue. The company is not listed in the 1918-1919 Copartnership and Corporation Directory and appears to be out of business by then. After Glycola, it looks like Brenwasser got back into the prescription drug business. 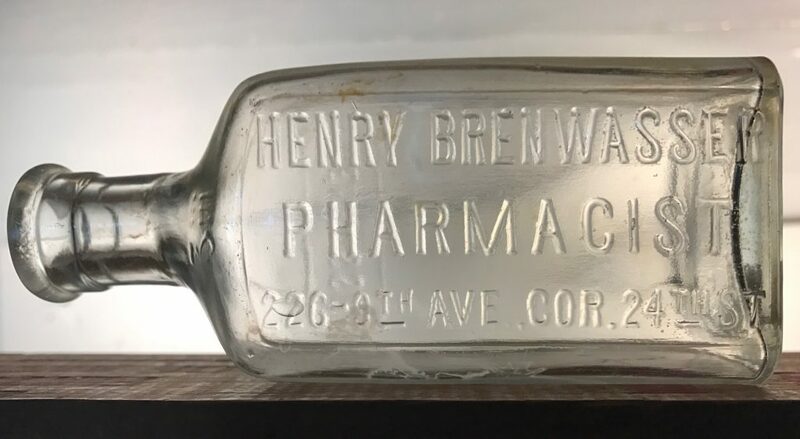 In the 1921 and 1922 editions of the ERA Druggist Directory of the US, Canada, Cuba, Puerto Rico, Manila and the Hawaiian Islands Henry Brenwasser (No Pond) is listed at the Ninth Avenue address. He’s not listed in the 1916 edition. It appears that Brenwasser was at the Ninth Avenue address from 1908 well into the 1920’s. 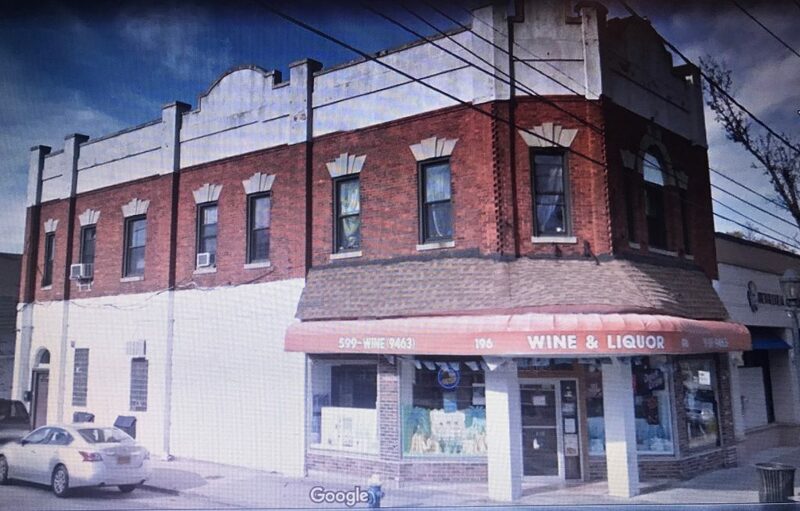 Frank N Pond also maintained other businesses associated with the 226 Ninth Avenue address before (Pond & Bowes), during (Pond Pharmacal Co.) and after (Pond Prescription Pharmacy) the Pond & Brenwasser era of 1908 to 1912. It’s not clear whether Pond and Brenwasser remained associates or not but it appears they shared the building or at least the address until at least 1916. 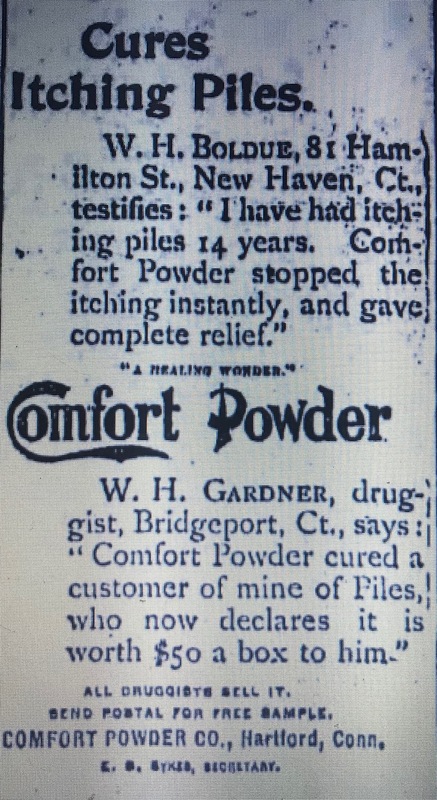 There appears to be no connection with the more famous Pond’s Extract Co.
Today 226 Ninth Avenue no longer exists. The location is now part of a large apartment complex. The bottle I found is a small (3 oz) mouth blown medicine bottle with a tooled finish. Embossing on the base indicates it was made by Whitehall Tatum Company (W.T. Co). The fact that there’s no ampersand (between the T and Co) indicates it was made after the business incorporated in 1901. 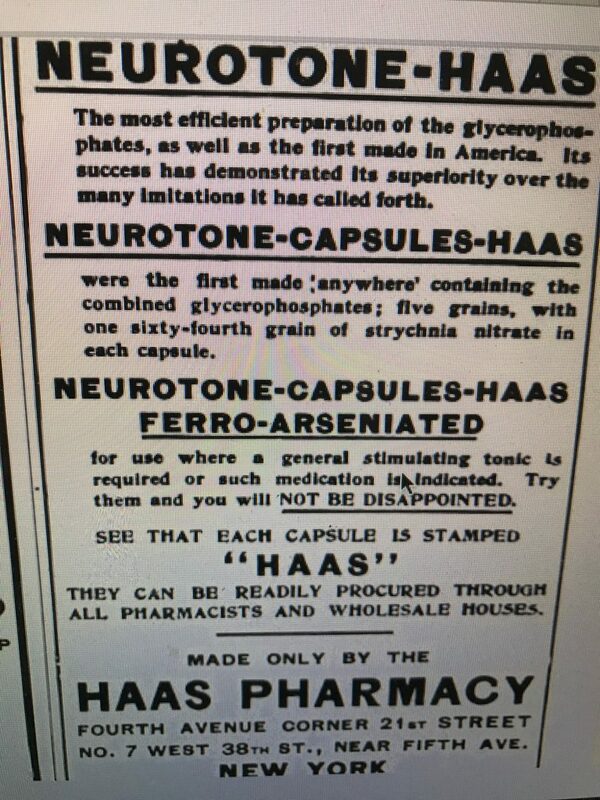 This fits with either the 1908 to 1912 period of Pond and Brenwasser or the post 1916 years, after Glycola, when he apparently went back to being a pharmacist. The fact that that Henry Brenwasser’s name is embossed on the bottle, not Pond and Brenwasser, has me leaning toward the later period.